On Beyond Bugs is one educational app from The Cat in the Hat’s Learning Library that teaches children all about bugs. This interactive application explores definitions and fun facts about various bugs such as the praying mantis, butterfly, ladybug and so many more. With the fun facts written in the traditional rhymes by Dr. Seuss, children will love learning all there is to know about bugs. The illustrations and animation in this app is done very well. Not only are children able to tap various pictures on each page to bring them to life, but they will also enjoy the various sound effects that accompany each page. Sounds like birds chirping, insects walking or flying help create a fun learning experience for children. Oceanhouse Media always does a great job with their graphics, sound effects, music, and characters to create easy to use apps for kids and On Beyond Bugs has all of the above and more. On Beyond Bugs is an app that is part of The Cat in the Hat Learning Library and offers children a fun way to learn about various bugs. Everything from ants, crickets, and praying mantises are included. As they follow along with the story (or read to themselves), there are various words that are in bold and when they are tapped a new window appears with a fun fact or definition of that word. This feature creates a fun and easy way for children to learn about bugs. The text highlighting also allows children to follow along with the narrator so they can learn new words and work on their reading skills. Children can also tap various illustrations to learn more words. Once the picture is touched the word appears and if the narration feature is turned on, the narrator will say the word. This feature helps early readers add more words to their vocabulary. Children that like bugs will certainly love this app. 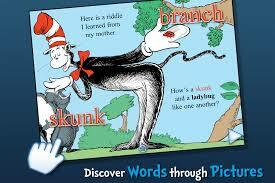 Not only is it a great rhyming digital book, but it also offers fun ways for children to interact with the story. Touching the various illustrations and words to learn more about bugs makes this interactive app not only educational but entertaining too. Priced just under four dollars, this app might be a little more than some parents might want to spend. With that said, it is full of wonderful information, high quality images and sound, and an interactive interface for children to use. There is no doubt children will enjoy this app and learn a lot from it, however I am not sure how long children will remain interested if they aren’t a bug-enthusiast. On Beyond Bugs has a very easy to use and safe interface for children to enjoy. There are no social media links to be concerned with and the only advertisements and in app purchase links are located on the main page. The additional apps link lists other apps in the Learning Library that parents and children might be interested in and since it isn’t protected in a parent’s only area, parents will want to be aware of this.